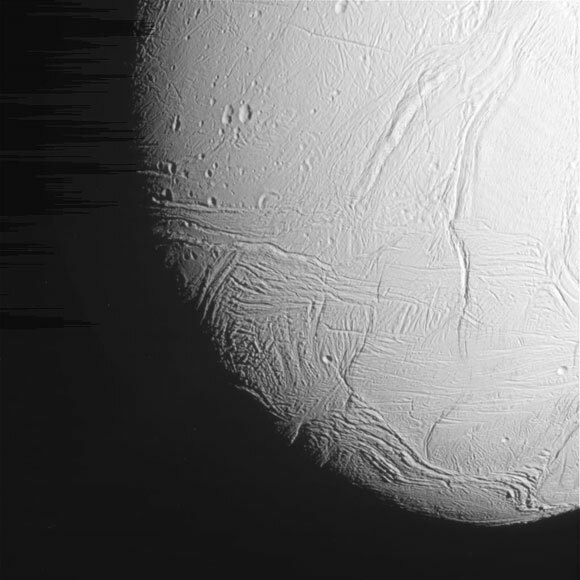 A new close-up of Saturn’s moon Enceladus from the Cassini Spacecraft. This unprocessed “raw” image of Saturn’s icy, geologically active moon Enceladus was acquired by NASA’s Cassini spacecraft during its dramatic October 28, 2015 flyby in which the probe passed about 30 miles (49 kilometers) above the moon’s south polar region. The spacecraft will continue transmitting its data from the Enceladus encounter for the next several days. Cassini’s next and final close Enceladus flyby will take place on December 19, when the spacecraft will measure the amount of heat coming from the moon’s interior. Be the first to comment on "Cassini Flyby Provides New Close-Up of Saturn’s Moon Enceladus"